Tina last appeared in Strip #114, then-unnamed. I’m going to have to move Selkie to a new webhost in the near future. Just a heads up in case any hiccups occur. George Sandy Wu Tony Ricky Hamud Moonsong Zeri and Mikella are part of the crowd in Panel 1, but I'm not going to tag them because they're too small to discern with any clarity. Thus begins the “You HAVE TO take us both – I’m not going without her! !” arc. Or, thus begins the “I´m ditching Keisha in a heartbeat if that´s what it takes to get adopted” arc. I REALLY hope not, and I really hope Andi enlists Todd’s help in dealing with this, so they end up adopting three kids between the two of them. Really, I can easily imagine Amanda making a stand re: I’d rather not be adopted than be adopted without Keisha. She already has experience regarding how having parents can be worse than not having, and I can see her considering the double adoption a litmus test regarding how badly they /really/ want her. Especially after Andi reveals she’s her real mom who didn’t want her before. Do kids even get a say in something like this, legally speaking? Figured the state/courts would decide where the kid goes based on what’s best for him/her regardless. More so since she’s getting reclaimed by her real mother rather than just adopted. Not me. Andi doesn’t deserve Todd. This may be her chance to redeem herself and shine, but the moment she took him out of the decision process that was it. He’s not perfect no, but he deserved a mite bit better than that. Now advice? Sure. But actual aid and being up close and personal, no. Very much no. I hope Amanda makes a stand, too. Strangely, it seems more in character for her as she can be so very strong-willed and have such powerful feelings. The times she turned on Heather were more due to circumstantial misunderstanding (added with a rejection complex) than Amanda being disloyal. I don’t know about Andi hooking up with Todd, but if she decided to come clean with him and he wanted to be in Amanda’s life (which I can’t see him saying no to) that could lighten the load for Andi to bring on Keisha, too. Of course the second is all wishful thinking on my part, but—as mean as Amanda has been to other kids—I don’t see her ditching Keisha at all. Identifying … unknown adult, accompanied by authority figure. Analyzing data … Conclusion: possible adoptive parent. Response: attempt to induce affection. Activate ‘impress adult’ mode, ‘good first impression’ protocols. I was thinking more of Star Wars, “Lock pigtails in attack position”. Tbh Keisha has been a bad friend. I’m glad Amanda will get adopted without her. For the record, this is NOT the usual commenter to talk under the name “Alphaghoul”. This is a person with a look-a-like name, capital G instead of lower-case. Email and IP address is also different. Red Alpha Alpo, also commenting in this strip, is ALSO commenting with the same email address and IP address as this “AlphaGhoul”. I also can’t help but notice that “Red Alpha Alpo” seems derivative of the commenter who usually goes by simply Alpo. The email address you’ve commented from has no other useage on the site, so I am approving these two comments out of morbid curiosity to ask: Who are you and why are you impersonating people? Thanks for pionting that out Dave, the only reason I found this is because I was looking to see if anyone already asked what I’m going to ask. Nevertheless, I never thought this sort of thing would happen to me. Oh man, that’s hilarious. I would guess that the answer to “Who are you and why are you impersonating people?” is that they are addicted to drama and want to provoke more of it. The thrice weekly “fix” of fictional drama isn’t quite enough. It’s for some people, like me, the sweet mary jane of a full color multi-weekly full page webcomic is enough. But this guy is clearly high on china cat or something and needs a higher dosage more often. Hope that Keisha doesn’t get adopted. She’s been a bad friend to Amanda. Okay, what am I missing? This is a troll, impersonating other users. Its two names mimicking the naming scheme of the first guy to comment on today’s comic and are both saying the same thing. I personally am tempted to suspect trolling either as an innocent voice who wants to be heard or a malicious one that wants to say something controversial and start an argument. Either way I disagree with the comment as kiesha has neither abandoned or manipulated Amanda as far as I can recall despite Amanda’s problems. I don’t even understand the need to mimic other people’s names. I’m ridiculously permissive about negative feedback and criticism on the commentaries. Overall, an embarrassing need for unearned attention mixed with an unfortunate malignant narcissism to believe he’s doing something new is my guess. So does Alpo have the same IP as the jerk? No, the impersonator and TheJerk have different IPs and emails used. I have an anthology of vampire short stories with a few of his contributions. I figure part of why he’s so good is his name. Gets you in the right frame of mind. Welp. It’s going to be awkward for Kiesha when she finds out that’s Amanda’s Mommy. So, is the Amanda being the only one colored in thing artistic expression before you color it all in or did you just decide to color her first. 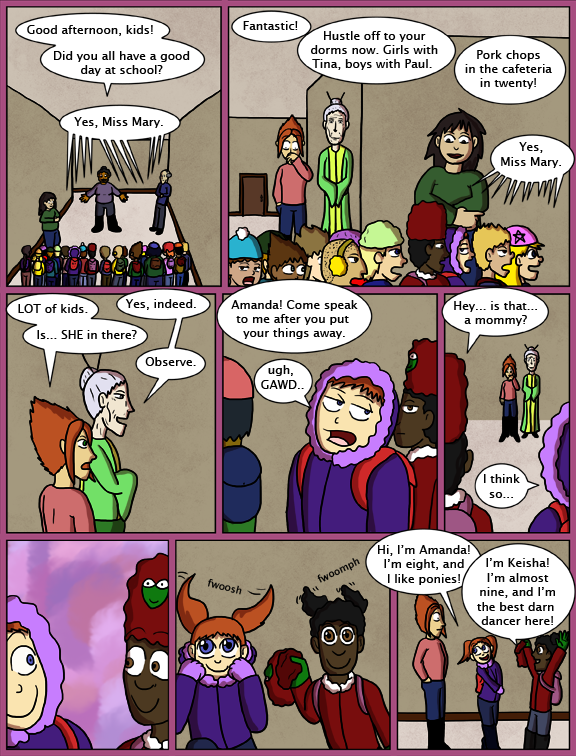 Had Amanda partly colord, looked at time and saw it was midnight, uploaded the in-progress strip. Hmm. It’s going to be interesting to see Andrea’s reaction to the dichotomy between Amanda’s discipline file and her adopt-me-now showmanship. I kinda like that Amanda is coloured when the others aren’t, it puts her response into sharp relief. This is a girl that despite the horror that was the last time still desperately wants a family. She deserved everything she got. Living up to your name again, I see. Aww, and here I thought they’d left! Get our hopes up, much? I thought you’d stomped out of here declaring you’d never be back. Are you really that desperate for attention? 5 year old children don’t *deserve* abuse, period. And she was only RETURNED when she was five. The abuse had probably been going on for some time before that. No one deserves abuse, that’s part of the nature of the name. Very young children especially. Doesn’t know she’s already won this round, does she? Yeah, this is EXACTLY what my first thought was. Does anyone else notice how Andi in panel five is looking shocked to see her kid for the first time? I kinda wish there had been a closer shot of it (but realize it wouldn’t work with the flow and all). Can’t wait for monday! And in the saddest of news, I’d like to give a shout-out/RIP to our dear beloved Sir Terry Pratchett who passed yesterday. He was a wonderful writer and a true gentleman in every sense of the word. He was both wonderfully funny and beautifully poignant. He will be dearly missed. XKCD did a simple strip honoring his passing and I admit, I cried a little. Fortunately I had a cat nearby to hug and absorb the tears. He didn’t mind. Indeed:( Death’s time came and his hourglass was up. I had the great good fortune to meet Sir Terry several times back in the 1990’s, before he really hit the big time. He struck me as being one of the nicest and most intelligent people I have ever met. I first discovered his books when there were only 2 Discworld novels. I was lent them by a friend who owned 3 copies of each, which were all always out on loan. He reread them whenever they returned to him. Since then I have bought everything by him I could get my hands on and have never read anything by him I did not enjoy, something I can say about no other author. The world is poorer without him, but at least the fans have his last novel to look forward to in due course. The silver lining to the passing of Sir Pratchett is that he did live almost a whole decade longer than originally estimated and we got a whole lot of fantastic literature out of it. According to Wikipedia, one last Tiffany Aching book was completed and is due to be published. The main thing I’m really sad about is that I never got to meet him in person. But he did reply to an email I sent him once. Discworld was one of my favorite series, so full of interesting and hilarious stuff. It’s a sad day to hear Sir Pratchett’s passed on. Outside of his novels, I still remember him a few years ago speaking out in favor of the right to self-terminate and thinking how brave he was for doing so. Honestly I thought about this for a while, and I thought the best solution to this situation would be to keep Amanda in the dark about Andi being her real Mom. Todd too for that matter, atleast until things settle down. Being a parent is about whats doing the best for the child even though its hard. Putting this kind of stress and drama may be absolving for Andi but Amanda its going to put her through a lot of emotions, especially if the Todd-Selkie thing is brought up too. When Amanda is older and Andi has proven she will be around it would be okay to give the truth. Though I am really looking forward to what Dave does, because he does such a good job of not only making this interesting, but making the characters feel human, and we dont always make the choices for the right reasons, and Andi is really feeling some heavy emotions right now. I don’t think Lying to Amanda will help anything, from my time on adoption blogs, the adoptees who were lied to had much more hurt, resentment and feelings of betrayal than ones who were told from as young as they could understand such things. I am a cool dude who doesn’t afraid of nothing! Also to Dave: Fun/boredom with the monotony of the comment section, mainly. Just want to liven things up. Don’t you all get your knickers in various states of twist. Also, original comment was only supposed to be posted once. Goofing around is fine, but I don’t know how the others feel about being impersonated, especially if it’s to speak poorly of one of the characters, so I’m gonna have to ask you to please stop it. Oh fine. Consider it done. Sorry Dave. Still love the comic. Well I am a cool dude. Though I prefer cool but rude. And I am not a party dude. Why not be yourself. We don’t bite. That service costs extra. Plus you would have more credibility than you have now as just that impostor. I cannot WAIT to see Amanda’s reaction when she finds out Andi is her REAL mother, and probably can’t take Kiesha. One kid is expensive enough, Andi’s an artist, which if you aren’t famous, BARELY pays the bills as it is. No way Andi could take care of two kids. Can’t wait for Monday! I don’t think it’s so much a money thing, but it would be very hard for Andi to adjust to two kids (one is biologically hers and the other adopted). It’s very complicated to begin with and a huge decision. I also don’t think it’d be more time before she’d even get approved for Keisha since they aren’t biologically related. Also, keeping Amanda around any other kid 100% of the time is, as the folks at the orphanage have already learned, *a really bad idea. * Having one parent have to manage her inevitable torment of her new sister instead of having a full bank of staff to control her would be an incredibly bad decision. Todd never reads Amanda’s disciplinary file – he “rejects” her because her cutesy act doesn’t resonate with him. Conversely, Andi may be the first potential adopter who gets interested in Amanda BEFORE seeing the cutesy act. So I think both Todd and Andi are acting from the right motives. That will help the readers continue to sympathize with them even though Amanda is going to point out a LOT of flaws in their actions. Hopefully Andi’s current emotional reaction isn’t bad enough to obscure her picking up on just how manipulative her daughter’s actions are. I do adore your ability to tell a wonderful and engaging story Dave. I’m both curious and slightly feeling some empathetic anxiety with Andi via the situation. She’s just learned that her child has been harmed in some way by the previous family, and then dump by said family. Amanda was given up twice, which is something I can only imagine to be a constant open wound, specially when seeing other children being adopted. (Slekie being adopted must have hit a rather large nerve considering Amanda thought herself far higher on the child totem pole. “Why did the ‘fish’ get adopted but not me? !” sort of deal. I wonder if Andi has the courage to tell Amanda the truth, or will she hide it for the time being via fear of her daughter’s reaction/waiting to find the best way and time to tell her after they get to know one another better. I do see the, “you have to take us both!” scenario, but it seems (to me) that there’s something much deeper at play. Keisha has been ther for Amanda, and has been one of the more level headed kids in Amanda’s life that I’ve seen so far. Should Andi state that she can take only one of them, I can only think of the new depths of drama (greek theatrical, not the mor enegative term oft used today) such a forked path can create for amanda. I wait with figurative bated breath to see how this chapter of the characters lives unfold. Cheers for your hard work and dedication! interesting that Keisha identifies Andi as “a mommy”. Heartwrenching, too. I noticed that. All the previous times there has been a potential parent there, the kids have referred to him/her as an “adopter”. Maybe Heather getting parents hit her harder than she realizes. I think the biggest thing I’m wondering about, now, is since Amanda was adopted as a baby and raised for 5 years by the Sandersons, is did she think she was a born Sanderson? Or did they tell her she was adopted? Both would probably put a totally different spin on things; if she thought she was a Sanderson, then was “dumped” by them, and now she finds out she has a real mom, it might be more positive, at least (kind of the whole “I”M ACTUALLY A PRINCESS! ?” sort of deal you see in fiction), but if she knew she was adopted by them, then I can for sure see the painful questions coming out in full force towards Andi. When Heather was telling Selkie about them she said they had “real kids” so I would say that Amanda knew. Am I the only one the only one hoping for Todd to drop Selkie off for a playdate or something? Okay, I have to say it. This is what’s killing me about Amanda. And yet this child is -still- the first to rush forward when a new person shows up at the orphanage because maybe, maybe this one will want her. None of the other kids even -noticed- Andi, but as soon as Amanda set eyes on her… there were the pigtails and the big eyes. This isn’t a kid who’s given up, this is a kid who’s still hoping. No matter how much she tries to say she doesn’t care, Amanda is still just begging to be loved. This is why I can’t believe she’ll easily leave Keisha behind without a fight—let alone ditch her. If this site had comment upvoting (that said, the programming for such is a bear and I understand why it doesn’t), I would agree with this comment so intensly that the internet itself would weep in pathos. I shrieked a little when I saw that you commented on this. I thought the polygamist family ended up not adopting and being escorted out because of the fight? But I could be misremembering, or they could have come back later. There is another option here – Some facilities (foster care houses at least that have several kids at once) allow folks to visit/volunteer as well. My hope is that Andi takes this slow, let Amanda and her both get used to each other before jumping into a permanent adoption. And a stable adult that can come and visit might help Amanda to find the trust she’ll need before leaving Keisha. This is a point I think the people here wondering about whether Andi will come out with the truth immediately are forgetting–at absolute best (it’s in a very visible location), it would very quickly lead to very, very awkward questions. She’d end up having to try to pass it off as a coincidence and pretend she had an old girlfriend or relative with that name, which would be even less believable since it’s going to be pretty clear she came for Amanda without meeting any other kids. What’ll happen will depend on what Andrea will believe is the best for the pursuit of her goals (getting Todd back, proving her mother she can be a good mother too), and whether she’ll listen to the advice of Ms Haversham-Zhang (the chance of which would be near zero, as far as I know her). Oh, and I love how you can actually hear the levers being turned to switch into cuteness mode.